Finding that the Omnivore 100 contained a chocolate I’d not met was a cause for celebration. After all, most any chocolate is good, right? 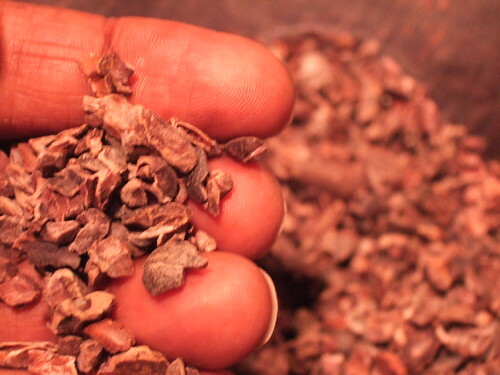 A quick search revealed that Criollo is a prized bean said by some to make the very best chocolate. It differs from its cousins Forastero, the most common bean from which the majority of the world’s chocolate is made, and Trinitario, a hybrid of the two. Criollo is described as being aromatic, delicate, slightly astringent, slightly bitter, complex, noble, and comparable to the Arabica coffee bean. It’s also rare, making up approximately 5 percent of all cocoa beans grown, because the trees on which it’s grown have delicate constitutions themselves. It sounded like something well worth trying — the crème de la crème of chocolate, perhaps — but tracking it down was the first order of business. Several phone calls placed a Grand Cru bar at ACKC, made with 72% cacao, and I unwrapped my find expecting to be transported to a heavenly realm. What I experienced was a very good dark chocolate bar. Its flavor was more delicate than others I’d had, and its scent and taste hinted at a sweetness of flowers rather than sugar. It was quite good, but not head and shoulders above the other dark chocolates I knew. Hmm. Was this lack of a developed palate on my part? Or did Criollo get too much hype? She generously shared fun facts on chocolate — that it’s grown 10 degrees North and South of the Equator in warm, wet climates such as Mexico, Central and South America and Africa — and handed over some models of cocoa pods and actual cocoa beans. Roughly 20 to 40 pods grow on each tree, after bugs fertilize the flowers. The pods measure approximately 6 to 10 inches long and 3 to 4 inches in diameter, are football-shaped, and somewhat resemble a delicate squash. The outsides can be a variety of colors, often yellow, red or brown. Inside each pod are beans within white pulp similar to the inside of a grape. The beans are harvested, fermented, dried, roasted and cracked. The inside of each bean has a dark, crumbly center. This is called the nib, and from it comes cocoa mass, or cocoa liquor, which is pressed to produce cocoa butter and a cake that can become cocoa powder. 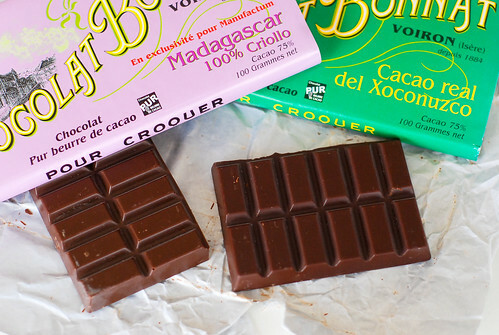 The total amount of cocoa products from the bean make up a bar’s cacao content. Most chocolates, Susan said, also contain added cocoa butter to make them creamy and quick to melt in your mouth. The polyphenols that make dark chocolate healthy are contained in the cocoa mass. Then we got to “work” tasting the chocolates, from a Hershey’s Bliss milk chocolate sweet and creamy from the added cocoa butter and milkfat to the harder, more bitter dark version. Next up were two from E. Guittard, a 61% Tsaratana and a Quetzalcoatl bar made of 72% cocoa mass, without added cocoa butter, that was more bitter and took longer to melt than the others. The crowning glory? 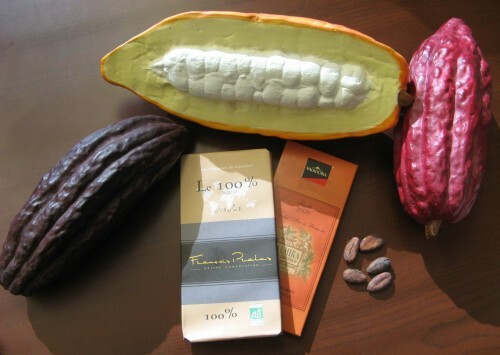 The two Criollo bars, a 64% cacao Palmira bar from Valrhona, and Le 100%, an all-cacao bar from Francois Pralus. The Palmira bar is said to have “notes of honey and nuts.” I can roll with that; it had the scent I remembered from the ACKC bar, and a sweetness that was more subtle than sugar. The Pralus wrapper presented that bar’s characteristics as “fresh nose, slightly minty and fruity, delicate to the taste, slightly acid.” This review differed a bit from what the lady at the Curious Grape had said. She described it as intense, earthy, and tasting “a bit like dirt, but in a good way.” I have to agree with her. Now, 100% is a whole heap of cacao, so this should be the pure essence of the bean, plus extra cocoa butter yet without niceties such as sugar. Think of the baking chocolate you begged to taste as a kid, and you’re getting close. But it’s much better than that. Even though I’m agreeing that it tasted like I’d imagine dirt could taste, I couldn’t quite leave it alone. While I got the same fragrance from the bar as from the other Criollo bars, the flavor was neither sweet nor bitter, and reminded me that the basis of chocolate is a plant. Each initial bite was almost chalky and dense with this indescribable flavor, but as it slowly melted in my mouth, a familiar but subtle dark chocolate taste formed around the outside. And then I’d have to try some more – purely in the name of research and an attempt to define it, of course. My final call? The 64% and 72% bars are good dark chocolate. The 100% is in a class of its own. You wouldn’t want to scarf down a bar of it during an afternoon slump — it’s too intense to each much at once, and it costs about eight times as much as your average Hershey bar. The author of the Omnivore 100 list must have tried a 100% version — it’s a unique taste experience, indeed.